NYC’s most original underground performers combine for a night of New Psychedelic Sounds and truly transportive XperiMENTAL grooviness. With a special performance by John S. Hall –author of the self-help parody DAILY NEGATIONS, and JESUS WAS WAY COOL. Three Rooms Press co-directors Peter Carlaftes and Kat Georges host. John S. Hall is the author of Daily Negations, a self-help parody and Jesus Was Way Cool, a collection of writing culled from numerous records by his band King Missile (of which there are 10) and his solo recordings (of which there are two). He has appeared on HBO’S Def Poetry Jam, PBS’s The United States of Poetry, and MTV’s Beavis and Butthead. He lives in New York City, but hopes to die elsewhere. 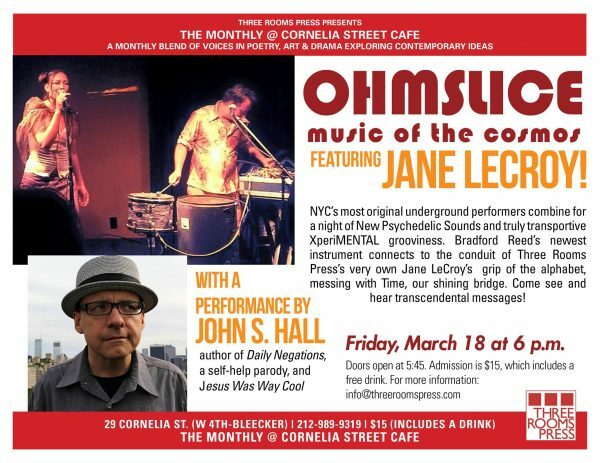 Composer/original instrument maker, Bradford Reed & poet/singer, Jane LeCroy, joining forces to make New Psychedelic Sounds conveying transcendental messages transmitted from the cosmos, providing you with truly transportive XperiMENTAL grooviness. Get your electrical resistance on with Experimental Music and Literature bathed in extraordinary extras of special guests. Must see Bradford Reed’s newest instrument connected to the conduit of Three Rooms Press’ very own Jane LeCroy’s grip of the alphabet messing with Time, our shining bridge. Come see hear, cosmic vibrations; we are tethered to other worlds.